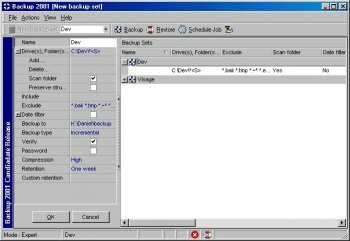 Backup 2001 is a backup and restore tool. It comes with a dual interface (wizard or expert mode). It uses an extended ZIP file compatibility. It has its own scheduler, but it can also be used through the Windows task scheduler. It manages the backed up files itself. Comes in English, French, Dutch, and German languages.